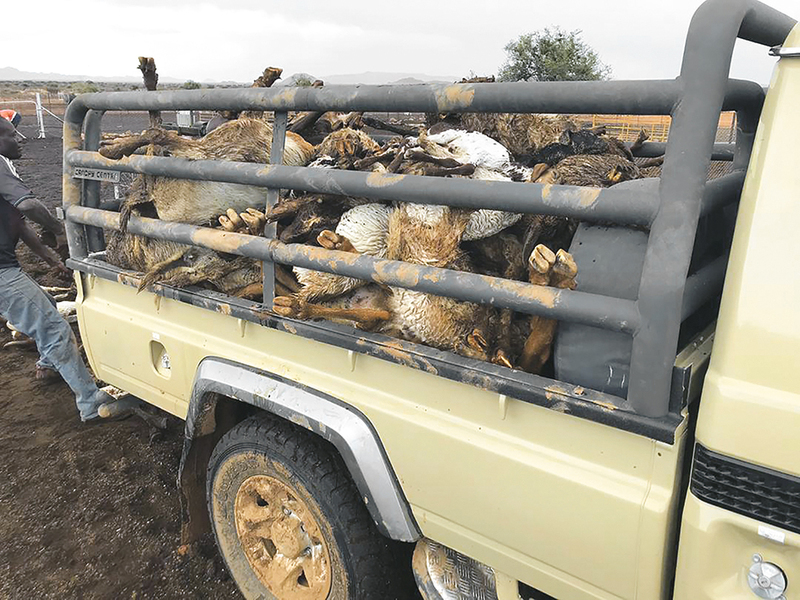 SCENES that would break the heart of any farmer in the world greeted some livestock producers on Wednesday morning when they went to the kraals and found hundreds of their animals dead. According to Piet Coetzee, a goat and sheep stud farmer near Groendraai, the damage to his farming operation is almost incalculable. Besides the losses in monetary value, which he estimates to be around N$600 000, the genetic material, cultivated over several years while developing his nine different Van Rooy and Damara sheep as well as his Boer Goat and Kalahari Red Goat studs are forever lost. “The sight of the dead animals in the kraals broke my heart. I was happy about the 74 millimeters of rain but an ice cold wind overnight left me extremely dismayed. This is not an easy situation to deal with. I don’t know if I will be able to recover from this or to even continue farming,” he said. He said he initially counted 82 animals before driving away but he was later informed by his workers that they discovered at least 50 more dead sheep and goats. “All we could do was to pick the dead animals up and to take them away to be buried. We still have to sort out how many lambs lost mothers and what we need to do to save what we could save,” Coetzee said. He said many of the female animals were pregnant which increases the loss in terms of monetary value as well as genetic material for his various studs. He said some of the farmers on neighboring farms lost all of their animals. “Some of my neighbors are literally ruined. I don’t know how they will ever be able to even continue farming. This is a disaster,” he said. Coetzee said another cold snap is expected for Wednesday evening which means that more animals could be lost. It is estimated that the farmers lost more than a thousand animals because of the extraordinary weather of the past few days.